Cognitive Behavioural Therapy (CBT) focuses on solving problems and learning new skills. The aim of CBT is to help clients to become and stay well, and its effectiveness has been demonstrated in clinical trials. In CBT, you and your therapist work together as a team to identify and solve problems. Your therapist will help you to overcome difficulties by changing your thinking, behaviour, and emotional responses in relation to particular situations that cause you distress. CBT has been shown to be effective for an array of psychological concerns including depression, anxiety disorders, and substance abuse, as well as for personality disorders. Further, its efficacy as an adjunct treatment to medication for mental disorders such as bipolar disorder and schizophrenia has also been established. The benefits of CBT have also been demonstrated for many medical disorders including chronic fatigue syndrome, irritable bowel syndrome, hypertension, fibromyalgia, post-myocardial infarction depression, non-cardiac chest pain, cancer, diabetes, migraine, and other chronic pain disorders. Schema therapy is a rich, innovative therapy that extends traditional cognitive-behavioural treatments and concepts by integrating elements from varied schools of thought. A basic premise of schema therapy is that people with more complex psychological problems have one or more problematic schemas (i.e., core beliefs about themselves or their world), which makes them vulnerable to emotional disorders. Schema therapy is particularly well suited to people with entrenched, chronic psychological problems. Clients with severe personality disorders typically respond extremely well to schema-focused treatment. Schema therapy consists of three phases. In the initial phase, your therapist works with you to help identify your schemas. During the second phase, your therapist helps you to get in touch with these schemas and learn how to notice them when they operate in your daily life. In the final phase you would be actively involved in replacing negative, habitual thoughts and behaviours with new, healthy cognitive and behavioural options. Psychoanalytic or psychodynamic psychotherapy draws on theories and practices of analytical psychology and psychoanalysis. With this form of therapy, your therapist helps you to make sense of and resolve your concerns by increasing awareness of your inner world and its influence over relationships both past and present. These types of therapy are typically called depth therapies as they aim to bring material to the surface, which is out of conscious awareness, and resolve the issues that arise from it. 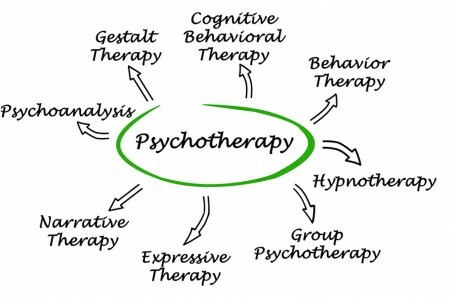 Psychoanalytic and psychodynamic psychotherapy aim to help people with serious psychological disorders to understand and change complex, entrenched and often unconsciously based emotional and relationship problems. This form of therapy has a long history and is evidence based in treating psychosomatic conditions, obsessional behaviour, trauma, depression, personality disorders, and anxiety. However, a therapist’s role is not only limited to clients with mental health problems. Many people who experience a loss of meaning in their lives or who are seeking a greater sense of fulfillment may benefit from psychoanalytic or psychodynamic psychotherapy. Dialectical Behavioural Therapy (DBT) is an evidence based treatment created by Dr. Marsha Linehan for those who suffer from emotional dysregulation. While the treatment was originally developed for nonsuicidal self-injury in individuals diagnosed with borderline personality disorder it has evolved to treat a range of populations, treatment modalities and disorders. The treatment has been proven effective for adults, adolescents, and children who struggle with self harm, suicidal thoughts/attempts, addictive behaviours, depression, bulimia nervosa, and high impulsivity. A comprehensive DBT program includes individual therapy, skills groups and phone coaching. Additionally clinicians are required to participate in weekly team consultation to ensure adherent treatment is being provided. Radically Open Dialectical Behavioural Therapy (RO DBT) is an evidence based treatment that was created by Dr. Thomas Lynch for disorders of overcontrol. Through 25 years of clinical research RO DBT has been proven to be effective for those struggling with anorexia nervosa, chronic depression, autism spectrum disorder, avoidant personality disorder, OCPD and maladaptive perfectionism. Comprehensive RO-DBT includes individual sessions, skills classes, phone coaching and requires the clinician to be on a treatment team. To learn more about RO DBT please visit the website website radicallyopen.net.